A recent edition of national newspaper the News of The World carried a small article about this statue by David Wynne which is sited in the Cathedral's Lady Chapel - it stated under a small headline of "Quite contrary over Mary" - "A controversial new statue of the Virgin Mary in Ely Cathedral has failed to grow on visitors. They moan the strawberry blonde Madonna looks like bra-less TV gardener Charlie Dimmock." Jaap Theunisz, Licensed Reader, The Netherlands. "When I saw it, I found it stunning, and have directed people to it ever since. 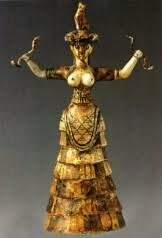 Leaving aside the blonde hair, I would say that there were unlikely to have been bras in the 1st Century AD, and I understand that the pose adopted is the way men were given to pray in those times. For me, there is a power in this aspect of Mary which we don't think about often enough. This is not "Mother Mary, meek and mild". This is the Mary of the Magnificat, giving thanks and praise to the God of Moses and Elijah." - Steve Mack. "This representation is the most wonderful one I have ever seen, it captures the young girl beautifully and has changed my view of Mary from a woman who was perhaps abused, really having little or no choice in the matter to a young woman joyfully embracing the task to which she has been called. 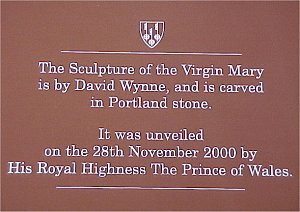 "Hello, I feel really rather shocked to see the vacuous comment on your webpage about the Mary statue "by David Wynne which is sited in the Cathedral's Lady Chapel - it stated under a small headline of "Quite contrary over Mary" - "A controversial new statue of the Virgin Mary in Ely Cathedral has failed to grow on visitors. 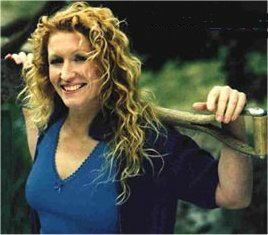 They moan the strawberry blonde Madonna looks like bra-less TV gardener Charlie Dimmock."" Editor's Note: In view of Leigh Griffith's remark about the Equality Act I decided to check into the Act and in my view it seems to refer to government bodies, employers etc. I therefore thought the other ancient tradition of "free speech" should take priority here. What do you think? Contact us here. "Dear Ely Cathedral. 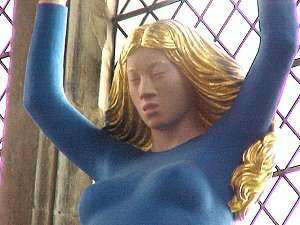 Regarding the statue of Mary in Ely Cathedral: I'm not a devotee of religion, so you are free to do as you please in your own temple from my point of view. However, just from an artistic perspective, I think it's a rather poor piece of work. The forms are primitive without being simple, the colours garish, and the overall effect is that of a mass-manufactured, giant-size action figure. It also seems to have been made with complete disregard for its location. It looks wrong in the medieval architectural setting. If, like an Orthodox icon, it is intend to inspire a mystical sense of devotion and numinous, then it is laughable. What a waste of good stone!" - Sincerely, Austin Hackney. 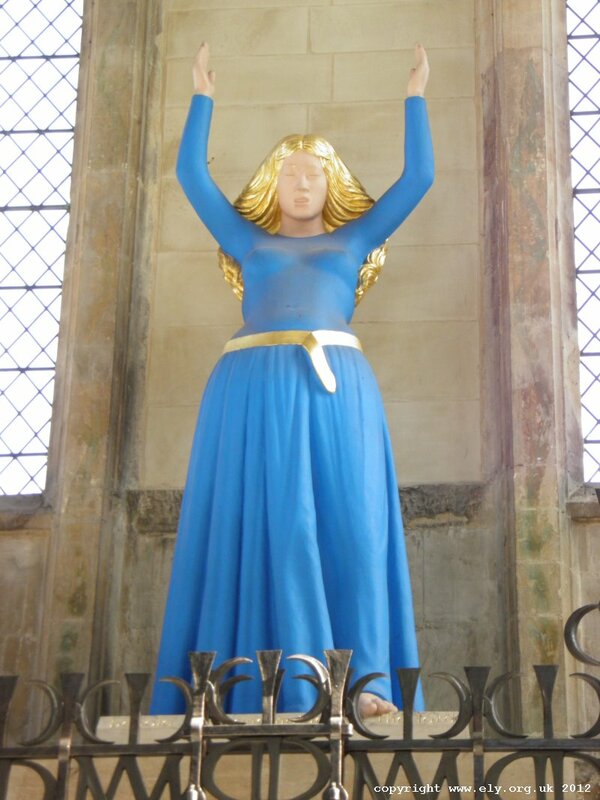 "Dear Sir/Madam, I recently visited Ely Cathedral and I was struck by the beautiful, imposing statue of Holy Mary in the Lady Chapel. Wishing to know more about the artwork, I read your website and was bewildered by the negative comments and by the allegation that the Church of England cannot properly understand the mystery of the mother of Christ. I am a catholic but I feel to be in close communion with the church of England and I think that it is due time that we look at Christ's mother as the revolutionary author of the Magnificat..." - Pietro Gallo, Rome!